Home Dicots A suitable case for the eXtreme botanist! A suitable case for the eXtreme botanist! OK, so you find this plant on abandoned railway sidings in West London. It looks like Ragwort (Senecio jacobaea) but the leaves are all wrong, they are very thin, even grass-like, alternate and clasping the stem. The flower books are not a lot of help and none of the illustrations looks anything like it. 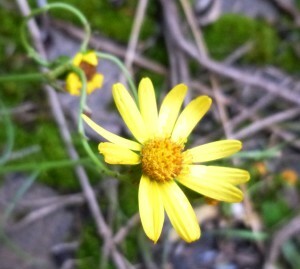 From the picture books you wonder about something called Fen Ragwort (Senecio paludosus). But that is extremely rare, previously thought extinct in fact, but rediscovered in 1972, on 18 July to be exact, in a fenland ditch within its former native range in Cambridgeshire (vice county 29), by Mr T. W. J. D. Dupree (check the full Asteraceous story here). And hold on a minute, what would a Cambridgeshire fenland rarity be doing on a disused railway in West London? (and don’t say it got on the wrong train!). So the mystery plant is clearly NOT Fen Ragwort! So you start to panic, may be it is really an Aster or a Fleabane but someone has swapped the flowers with ragwort… OK now you are getting desperate! This sounds like a suitable case for the eXtreme botanist! What to do? Well in such a situation, whatever you do, don’t panic! If you have a camera with you take some pictures of the plant and make some notes of any features which may not be clear in the photos, habitat details, finer details of leaves and flowers etc. If the plant is obviously not a rarity (i.e. there’s shed loads of it around) then pick a small specimen and take it back in a poly bag for later examination. When you get home you could then post the pictures on one of the helpful botanical sites like the NHM Nature Plus Community where the incomparable Dr Fred would solve your botanical conundrum, maybe even in minutes! BUT…why not go the whole eXtreme botanical hog, why not have a go yourself? (1) The Book of Stace: if you go with your gut feeling and say this must be a kind of Ragwort, maybe just one that the picture books don’t know about. Then, because the photos show the flowers, you can go straight to the Ragwort (Senecio) section in the Book of Stace (page 760 of the 3rd edition 2010). This turns out to be a good move and not as tricky as you might fear! Stace’s key to Senecio asks first, in couplet 1, if the plant is woody at the base. Actually this plant can be woody at the base, but this is not obvious in our plant, and the key actually allows for both answers because this plant varies in woodiness. So we say, no, our plant is not woody at the base, and we move to couplet 6, which asks if there are ray florets and what colour they are, they are present and they are a lovely yellow, so next is couplet 8. Couplet 8 asks if the leaves are simple or lobed, they are simple, so we move to couplet 9, which asks if there are zero ray florets in the capitulum, or if there are more than 4. The photos clearly show more than 4 ray florets per capitulum so on to couplet 10. Couple 10 asks again about the number of ray florets, and the two choices are 4-8, or more than 8, our plant has about 12 per capitulum, so we move to couplet 13. 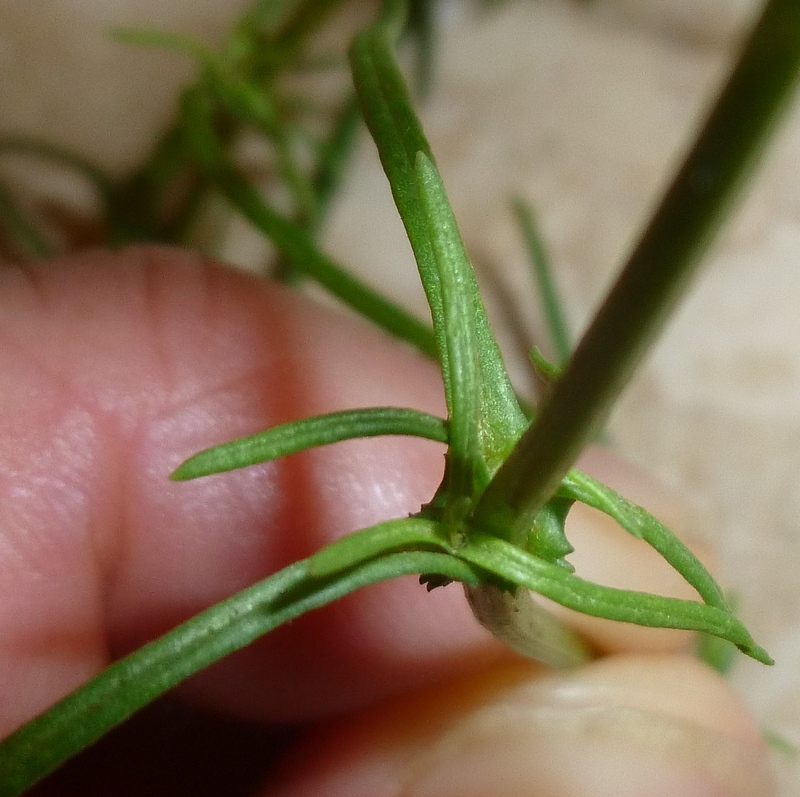 Couplet 13 asks if whether the leaves are narrow and linear or whether they are ovate/lanceolate, our plant clearly has narrow linear leaves, it was what we first noticed about it, and so we have an answer: Senecio inaequidens with the very appropriate vernacular name of Narrow-leaved Ragwort. This is a good answer and the right answer! This is a non-native perennial herb naturalised in a few localities e.g. in East Kent, but elsewhere it is a casual on arable and waste ground, such as the railway siding in West London! (2) The veg key: If you were not sure enough about Ragwort to go with the Book of Stace, then maybe there is enough information in the photos to try the veg key. OK this may seem perverse, there are flowers so why use the veg key? But as Dr M has said before, and will say again, the veg key is so good you can use it to ID plants in flower as well as those not so floriferously blessed! Well, it turns out that the veg key also works well for this plant even just from the photos. The important features to start with (key to major divisions on page 9) are the simple leaves with toothed margins (look carefully at the photo and you will see the slightly toothed margin). Together with the alternate leaves, this is all you need to get to section ‘N’ (page 220). 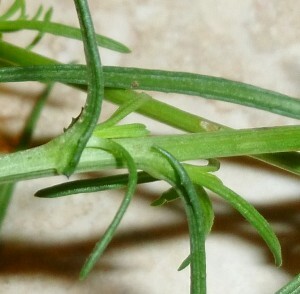 In section ‘N’ the important characters are that it is a herb, without stipules, with no latex, and with sparse cottony hairs – these are just visible in the photo if you click it and then a second time to enlarge the image. This is where taking good notes in the field or bringing a specimen back from the field for later scrutiny can be helpful. This information gets you on to section ‘NO‘. Important characters in section ‘NO’ are that there is no obvious petiole, the plant is a ruderal species (common on waste ground, such as the now infamous railway siding) and the leaves are revolute when young (this means young leaves are curled back on themselves, and you can see this in the photos). This final information gets to our answer, and it is the same answer as before, which is comforting: Senecio inaequidens (Narrow-leaved Ragwort). So you see dear reader, eXtreme botanists shouldn’t be afraid! eXtreme botany rocks the plant world! All images by Corin Simmons to whom also thanks for inspiring this tale of eXtreme botany.